VIRAL: Back to the Future WTF? Check out this viral video from Argentina that features a mysterious car and driver who are excited to arrive in 2011. 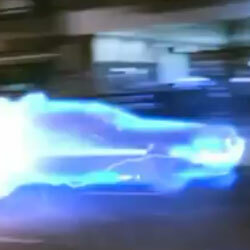 Is this a viral video for an upcoming Back to the Future movie, a video game teaser, or something else? UPDATE: This apparently is a commercial for the store, but to add to the viral campaign, here is the stores “security cam” footage of the event. Appears to be a promotional ad for the electronics store that the DeLorean “crashes” into. The photos posted on that site explain that the car is on display at the location until Saturday. They must be a well to do business to afford to make this commercial. It’s an amusing commercial, too.